NOTICE: Activation key must be used on a valid Steam account. Requires internet connection. 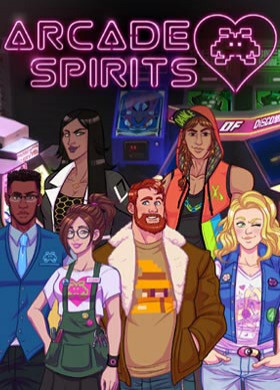 About the gameArcade Spirits, a romantic visual novel, follows an alternate timeline set in the year 20XX where the 1983 video game crash never occurred. After a turbulent work history, you are granted employment at the Funplex, a popular arcade, home to a host of unique personalities and customers. Wh… ere will this new-found employment take you? Who will you meet along the way? Will you find the romance you're seeking? Key Features Design your own character from the ground up - pronoun, hairstyle, skin tone, hair color, eye color and more are completely customizable and are reflected throughout the game in both gameplay and artwork! With roleplaying-based choices, you will be able to grow your personality and relationships in any way you desire; Friendship, Platonic or something more intimate! Work hard and build the relationship you desire with a total of seven romanceable characters! The Identity Identifier System, or IRIS, can track your relationship statuses with all characters throughout Arcade Spirits as well as your personality traits, from Quirky, Steady, and Kindly, to Gutsy and Basically. Everything you choose in Arcade Spirits, from your relationships to your personality, your crisis management moments, and a myriad other decision will have an effect on the future of your arcade! System Requirements Windows - Minimum OS: Windows XP Processor: 1 GHz Intel or AMD Processor Memory: 1 GB RAM Graphics: DirectX or OpenGL compatible card DirectX: Version 9.0c Storage: 100 MB available space Windows - Recommended OS: Windows Vista or above Memory: 1 GB RAM Mac - Minimum OS: Mac OS X 10.6 or later Processor: 1 GhzCore 2 Duo Memory: 1 GB RAM Graphics: DirectX or OpenGL compatible card Storage: 100 MB available space Mac - Recommended OS: Mac OS X 10.7 or later Memory: 1 GB RAM Linux - Minimum Processor: 1 GHz Intel or AMD Processor Memory: 1 GB RAM Graphics: DirectX or OpenGL compatible card Storage: 100 MB available space ©Fiction Factory Games. Published by PQube Ltd. All rights reserved.